Sally, Tim, Gina, Geoff and Yasmeen are all dressed in circus outfits making the final preparations for the Speed Daal family day. As Sally takes to the stage to thank everyone for their fundraising the police arrive and arrest her on suspicion of fraud, bribery and money laundering! 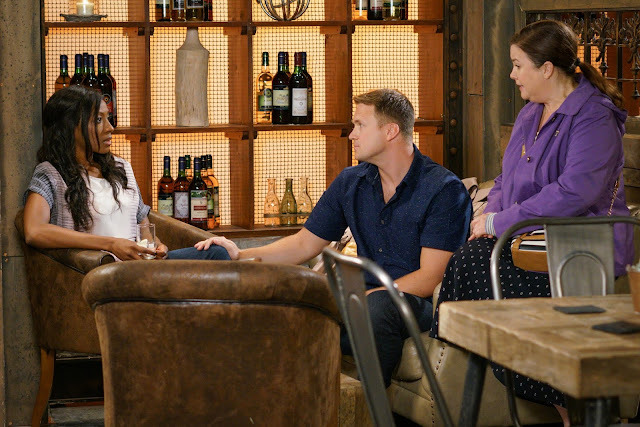 Adam reveals he can’t represent her as Imran is representing Duncan. The police interview Sally who pleads her innocence. Geoff offers to buy Imran’s share of the restaurant, Yasmeen turns him down, determined she can manage. Hearing this Alya approaches Carla and handing her Aidan’s DVD explains that she realises the importance of family and is willing to sell her the factory for the value of Aidan’s original stake. Carla is delighted. Sean is shocked to find Johnny and Jenny have taken over the Rovers and cut his hours. 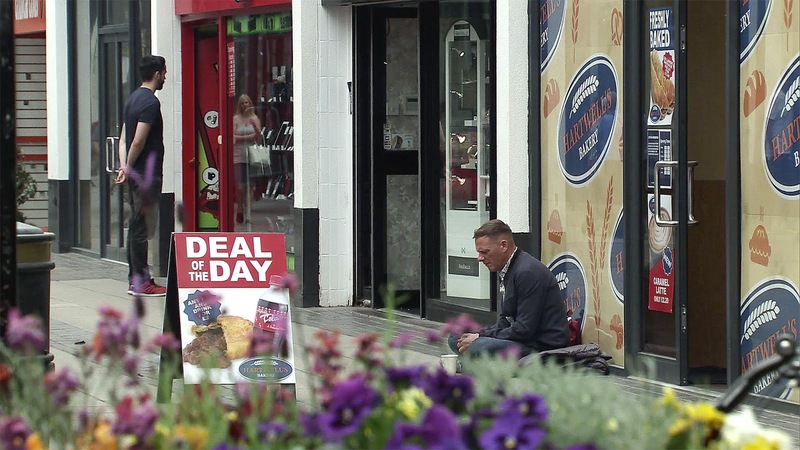 Things get worse when his homeless friend Frank comes in, desperate to get rid of him Sean tells him he will bring him a free drink round the back. Finally, Jude makes out to Mary that he’s taking Angie for a romantic lunch. Jude and Angie attend another marriage guidance session but admit they’ve made no progress. 9533 MONDAY AUGUST 13TH - WILL SALLY AND TIM CRUMBLE UNDER PRESSURE? The police present Sally with copies of her bank account and demand to know why Duncan deposited £1000. Sally quizzes Tim who admits the £1k was not a bonus from Streetcars and he thought it was a bank error. Sally is angry and points out he has made her look guilty and that Duncan is claiming she and him were having an affair. 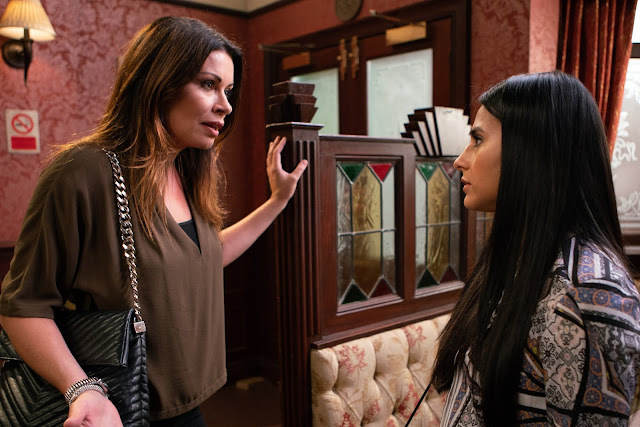 Carla confides in Johnny and Michelle that she is struggling to raise the cash for the factory. Alya is pleased when Carla arrives in the pub and orders champagne saying she is ready to buy the factory. When Jude lets slip that it’s their wedding anniversary tomorrow, Mary insists they must celebrate. Angie masks her dread. Checking the coast is clear, Sean helps himself to a vodka behind the bar, intending to take it out to Frank. However Jenny catches him red handed. When Sean fails to offer a decent explanation, Jenny and Johnny tell him they’ve no alternative but to fire him. Sean’s devastated. Elsewhere, Toyah applies for the Counsellor position at the medical centre. Peter overhears Carla talking about buying the factory and has an idea and tells Alya that he is Carla’s investor and she will have the money today. How will Carla react? Sally’s picture is all over the press. Furious that Barlow Legal Services are representing Duncan, Sally storms round and has a go at Adam. Sally and Tim decide to stake out Duncan’s house to speak to his daughter but Duncan approaches the car and starts goading Tim. MARY COTTONS ON TO AN IDEA At Mary’s suggestion, Jude invites Angie for an anniversary lunch. When Tracy mentions that one of the wedding venues she looked at is an old cotton mill, Mary has an idea. Taking in Sean’s dishevelled state, Eileen’s concerned to hear he’s lost his job. Eileen buys Sean lunch and quizzes him about his living arrangements. Sean makes out he’s living at a friend’s flat in town and having a ball. Gary arrives back from Scotland. He’s furious to find a pile of unpaid bills. Sarah suggests to Gary she could look after his paperwork. 9535 WEDNESDAY AUGUST 15TH - WILL CARLA ACCEPT PETER’S PROPOSAL? Carla is moved when she hears Johnny talking about the importance of family. She decides she should accept Peter’s offer but tells Michelle she will keep him at arm’s length. Carla and Peter let themselves into the factory and survey their empire. Carla becomes emotional about Aidan. Tim is stunned when the police knock at the door and arrest him. Tim returns from the police station having been let off with a caution but he has a shocking admission for Sally. Over lunch, Jude does his best to persuade Angie that they’ll find a way to make their marriage work. When Adam calls in Speed Daal, Jude can’t help making snide digs. Angie despairs of him. Eileen shares her concerns about Sean, telling Fiz that he’s lost his job and she doesn’t even know where he’s living. When Sean tells Carol that he’s completely penniless she points out that he’ll have to start begging as he’s no alternative. Sean’s horrified at the thought. Sean sits on a street corner wrapped in his sleeping bag. When a child drops a pound coin in his empty mug, tears spring to Sean’s eyes. Meanwhile, Sarah convinces Gary that she’s happy to work for free as his office manager. Worried he might die Rana is desperate to see her father. Kate suggests she could pretend they have split up to change her mum’s mind. Billy helps distract Saira giving Rana the chance to see him. Saira is furious when she finds out. Carla tells the staff she is their boss again and asks Sarah to stay on as PA. Leanne meanwhile is unimpressed that Peter is back in business with Carla. Peter resigns from Streetcars. Meanwhile Audrey’s taken aback when she receives a prison visiting order from Lewis. Gail checks her bank account and is astounded to see a credit of £40k from Lewis Archer. 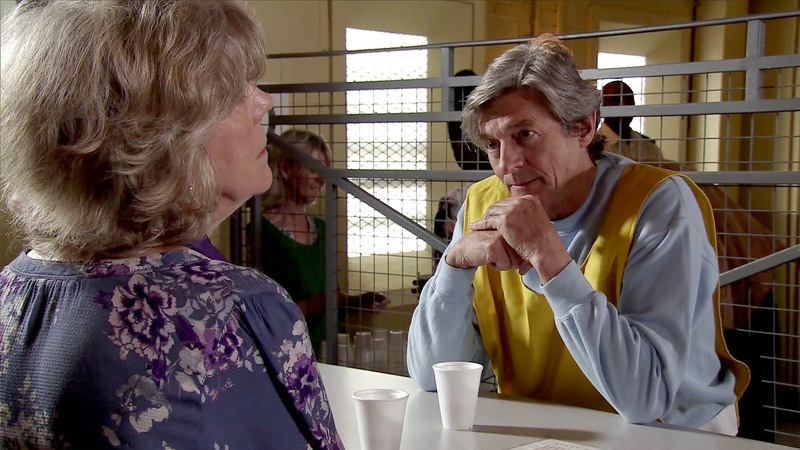 Audrey visits Lewis in prison. Faye suggests to Seb he could visit her in Durham but it’s clear he’s not keen. Sean begs outside the hospital but when he spots Billy and Rana approaching, he quickly grabs his cup and sign and darts out of sight. 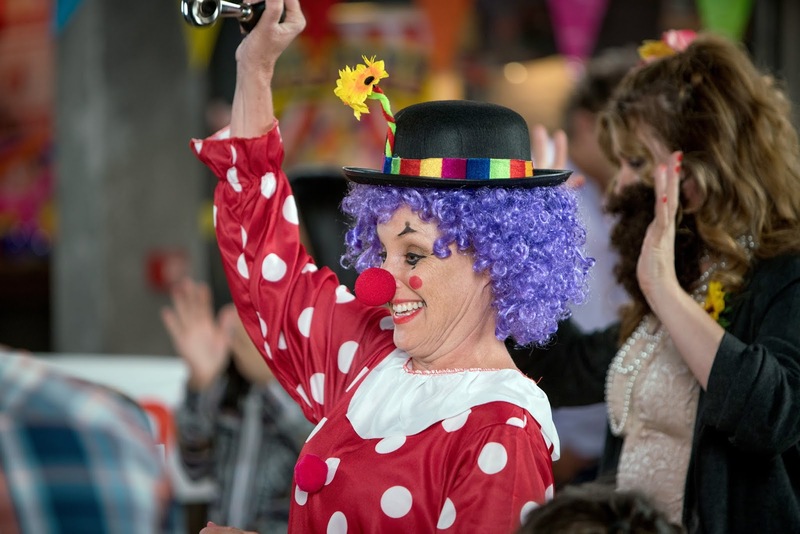 When Gina reveals that she’s hired Sally’s old school pal Paula Cunliffe who is now a hot shot solicitor specialising in fraud, Sally does her best to appear enthusiastic. Gary is not best pleased when Sarah reveals Gail will do the books at the builders yard. Saira agrees to let Rana visit her father but as Saira tells Hussan that Rana has seen the error of her ways he squeezes his daughter’s hand and passes away. Rana is wracked with guilt that she lied to her father on his deathbed. Lewis does his best to convince to Audrey he’s a changed man and that to prove it, he handed himself into the police and transferred £40k into Gail’s account. Lewis tells Audrey that she’s the only woman he’s ever truly loved and reveals that he’s due for release on Wednesday. Audrey’s torn. When Gail confides in Audrey how Lewis has given her £40k and she’s deeply suspicious, Audrey suggests that perhaps he’s turned over a new leaf. Paula Cunliffe calls at No.4 to discuss Sally’s legal position. Sally’s taken aback to realise how down to earth she is and not as she remembers her at all. Paula assures Sally that she has a strong case as Duncan’s evidence is purely circumstantial. Meanwhile, Billy visits Josh in hospital. Josh blames Billy for the fact he’s blind and will never be able to lead a normal life again. Billy’s consumed with guilt. In the Rovers, Leanne approaches Imran about the PA vacancy at the solicitors. They hit it off immediately and Imran invites Leanne back for a game of Scrabble. Peter breaks the news to Carla that he plans to work at the factory full time. Carla has little choice but to accept his decision.